Our apartment was completed in 2011 and completely redesigned and equipped in August 2018 by the carpenter. 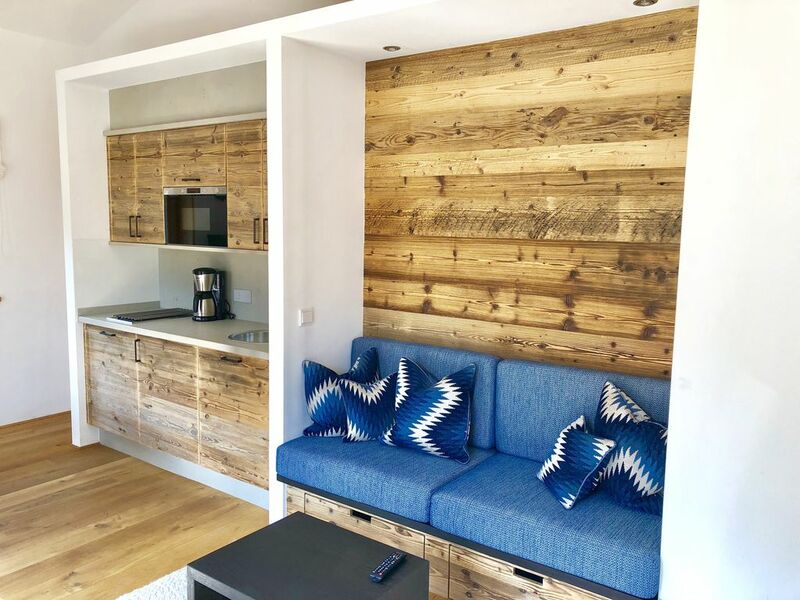 It has 1 bedroom with double bed, a modern bathroom with underfloor heating, a spacious and cozy living-dining area and a beautiful balcony with a southern orientation and a view of the mountains. A small garden is also available. The decor is new and modern. The kitchen has all the necessary utensils. There is also a Nespresso coffee machine. Capsules can be brought along or bought on the spot. The apartment is ideal for holidays at all seasons. The ski resorts Spitzingsee and Sudelfeld are nearby. In no more than 15 minutes they are in the middle of the slopes or on the cross-country ski run. From Neuhaus you can also make numerous day trips. You can reach Salzburg, Kufstein or Munich in less than an hour. There is a ski and bicycle rental nearby. In the new Montemare Vitalwelt in Schliersee you can relax with a sauna or swimming. You can walk to the Markus Wasmeier Museum and the famous whiskey distillery Slyrs. Die Wohnung ist neu, hell und für zwei Personen durchdacht eingerichtet. Uns hat es an nichts gefehlt und wir haben einen sehr entspannten Aufenthalt verlebt. Vielen Dank! Wir haben uns in dieser modernen und gemütlichen Ferienwohnung sehr wohlgefühlt. Die Lage ist ruhig und die Wohnung ist sehr sauber und modern eingerichtet. Kommen bald wieder. Die Gastgeberfamilie ist freundlich und nett. Offene Fragen oder Wünsche werden sofort erledigt. Die Wohnung liegt günstig und per PKW oder auch mit dem Bus können schöne Ausflugsfahrten gemacht werden. Wir haben uns immer wohl gefühlt und waren rundum zufrieden. Wanderer kommen voll auf ihre Kosten und können sich in eine ruhige Wohnung zurückziehen. Hat alles wunderbar gepasst, wir haben uns sehr wohl gefühlt. Eine sehr schöne Ferienwohnung mit traumhaftem Blick auf die umliegenden Berge. Vielen Dank für den tollen Urlaub. Hiking, mountain biking, climbing, Nordic walking, swimming, sailing, surfing, fishing and winter skiing, snowboarding and cross-country skiing ... And in between: golf courses with spectacular tee scenarios, riding stables with lush green meadows, cycling trails through lush geranium-decked villages ...! The adjoining Spitzingseegebiet with its inviting pastures and the most easily accessible peaks is a walker's paradise! From simple walks, rewarding alpine walks or challenging mountain tours, there is for any guarantees the right trail here. Three mountain railways - the Taubenstein gondola that Stümpfling chairlift and Suttenbahn - bring the wanderer in the surrounding mountains with their total of ten peaks. Upper Bavaria, born as a holiday destination! For more information about Schliersee can be found on its website. Golf: Margarethenhof in Bad Wiesee. Valley Golf Club between Tegernsee and Munich. Ski: The ski area Spitzingsee-Tegernsee is distributed between the two mountains Stümpfling and Taubenstein. It provides for every skier level corresponding departures .. The Spitzinggebiet has three black runs to a total of 5 km for the intermediate and advanced. The 13 red slopes are waiting for experienced skiers and five blue runs round the slopes for beginners.